It’s a few minutes before 6am. The silence of the conference room is broken by the distinct sound of crayons being poured into foil tin pans and shifted into place. The tins, about eight to a table, flank empty color-coded sorting bins eagerly waiting to get their fill of what they came for. Volunteers trickle in, donning bright red T-shirts and name badges. Feeling nostalgic, they dig their hands into the mounds of crayons and remember what it felt like to be kid. Then they think of the hands of the kids who will hold these crayons next and get to work. CSAA Insurance Group is a founding partner of The Crayon Initiative and has been an integral part of helping the organization grow the past three years. Inspired by the mission of The Crayon Initiative and the passion of its founder, Bryan Ware, CSAA Insurance Group invested in projects early on like purchasing a mobile trailer equipped with cook stoves, shelving, a diesel generator for air conditioning and electricity to take a melting station on the road. But they wanted to do more than just supply goods. Roger Hancock, manager of Community Affairs for CSAA Insurance Group, saw an opportunity to engage employees to volunteer in onsite crayon sorting events that are rewarding, meaningful, and fun. CSAA Insurance Group is nationally recognized for its employee volunteer program, earning a 99% participation rate annually, and The Crayon Initiative helps them keep their engagement up. Over 300 employees participate in a day of team building and giving back. CSAA Insurance Group employees enjoy working with Bryan and are moved by what it means for kids at children’s hospitals. This is helpful because sorting days are long, but volunteers believe in the mission and are excited to get involved. In fact, team members try to minimize the work involved for sorting events, often arriving the night before and going the next day from 6am – 8pm. It’s a lot of work – sorting, set-up and clean up afterwards – but it’s worth it. CSAA Insurance Group is proud of the work they have done with TCI. The partnership has garnered national attention and more importantly, given free art supplies to thousands of kids in hospitals since the program started. 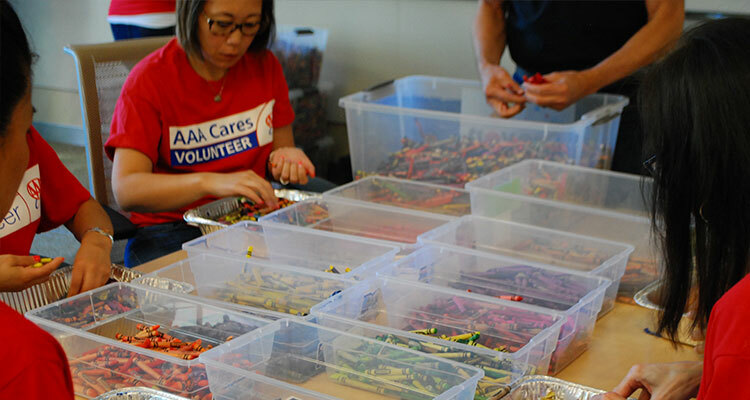 At a recent visit to Fairfield, Calif., CSAA Insurance Group volunteers sorted 540 pounds or approximately 70,000 crayons. These crayons will be remade to be distributed into the hands of 27,000 thousand pediatric patients at hospitals nationwide. In 2018, the CSAA Insurance Group-dubbed ‘North America Crayon Tour’ will continue hosting sorting and crayon making stations at employment operations in the Bay Area, Oklahoma City, Colorado Springs, Las Vegas, Phoenix and New Jersey. They would also like to expand these events and invite individuals and representatives from partnering children’s hospitals, and perhaps including children and their families to come and speak about the benefits of The Crayon Initiative and what it has meant to them.